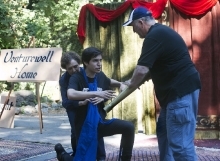 Marsha Van Broek as Nell, Alexander Espinosa Pieb as Rafe, and Lee Vogt as George, the Citizen Grocer. Photo by Anna Kaminska. 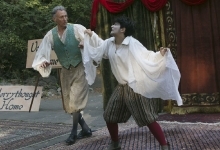 Bruce Kaplan as Master Merrythought and Kaz Valtchev as Jasper Merrythought. Photo by Anna Kaminska. Shannon Mauldin as Michael Merrythought. Photo by Anna Kaminska. Alexander Espinosa Pieb as Rafe. Photo by Anna Kaminska. 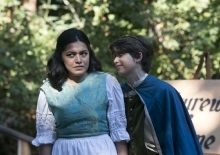 Alexander Espinosa Pieb as Rafe and Polina Litvak as Humphrey. Photo by Anna Kaminska. 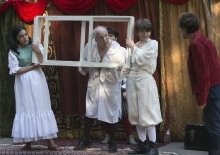 Katherine Garcia, Bruce Kaplan as Master Merrythought, Kaz Valtchev, and Polina Litvak. Photo by Anna Kaminska. Katherine Garcia, Bruce Kaplan as Master Merrythought, Kaz Valtchev, Polina Litvak, and Marsha Van Broek as Nell, the Grocer's Wife. Photo by Anna Kaminska. 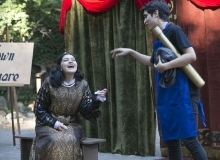 Katherine Garcia as Pompiona and Alexander Espinosa Pieb as Rafe. Photo by Anna Kaminska.